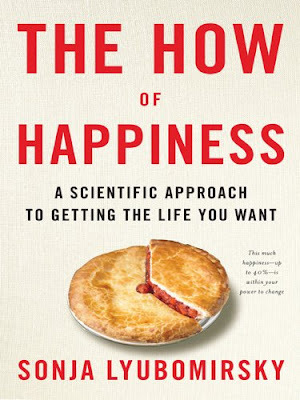 I found this book because it focuses a lot on the concept of the set-point of happiness. 50% of happiness is a genetically-predetermined set point and can't be changed. 10% of happiness is circumstantial, so changing external circumstances isn't the most effective pressure point for change. 40% of happiness is determined by intentional activity. So there is quite a bit of room for hope. Another thing I really liked about the book is that it tries to personalize your happiness improvement program by finding which activities would fit you best, using the criteria of enjoyment, natural fit, and aligning with values, while avoiding the motivations of guilt and circumstance. The ones that fit best for me were true engagement, savoring life's joys, practicing acts of kindness, and expressing gratitude. To be honest, my initial reaction to trying to work on these areas was not positive. I tried to really engage at a concert I was attending and ended up not succeeding. So not only was I not really enjoying myself, but I was beating myself up for not being able to be attentive. It's a tricky balancing act between working towards being a happier person, while at the same time being okay with where you're at now. Is that even possible? Maybe no self-help books work because we harbor the unrealistic expectation that all we have to do to make them work is to read the book. Sonja pounds in the lesson that it takes effort and commitment to change something as habitual as happiness. This is why I can't fairly judge the impact of a self-help book until quite a bit of time passes. Was I impressed with it now? Yes. Will I remember it in a year? Probably not.